Information is the key to sound decision-making, to accountability and development; it underpins democracy and assists in combatting poverty, oppression, corruption, prejudice and inefficiency. Administrators, judges, arbitrators, and persons conducting inquiries and investigations depend upon it; likewise the press, NGOs and individuals concerned to report on issues of public interest. Unwillingness to disclose information may arise through habits of secrecy or reasons of self-protection. But information can be genuinely private, confidential or sensitive, and these interests merit respect in their own right and, in the case of those who depend on information to fulfil their functions, because this may not otherwise be forthcoming. These competing considerations, and the balance between them, lie behind the issues on this appeal. This greatly excited those in the information rights field at the time, but since then, there has been little of prominence to advance the proposition that FOIA rights are not the only route [Ed. there’s a great/awful pun in there somewhere] but it did get a positive airing in R (Privacy International) v HMRC  EWHC 1475 (Admin) (on which see Panopticon post here). Yesterday (12 October) barrister Jolyon Maugham announced that his Good Law Project was seeking donors towards a judicial review application if the government refused to publish information and reports comparing the predicted economic harm of Brexit with the predicted economic benefits of alternative free trade agreements. Keen followers of information rights litigation will note that Tim Pitt-Payne and Robin Hopkins are instructed: the potential respondents should quake in their boots. Well worth watching this, and well worth – in my opinion – donating towards the cause. An adequate response to Brexit? If the UK is not part of the EU, then upcoming EU reforms to data protection law would not apply directly to the UK. But if the UK wants to trade with the Single Market on equal terms we would have to prove ‘adequacy’ – in other words UK data protection standards would have to be equivalent to the EU’s General Data Protection Regulation framework starting in 2018. 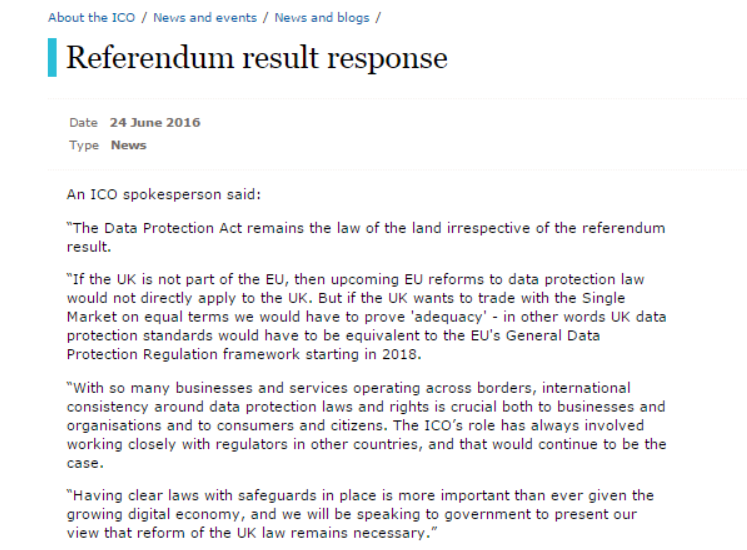 Over the coming weeks we will be discussing with Government the implications of the referendum result and its impact on data protection reform in the UK. With so many businesses and services operating across borders, international consistency around data protection laws and rights is crucial both to businesses and organisations and to consumers and citizens. The ICO’s role has always involved working closely with regulators in other countries, and that will continue to be the case. Having clear laws with safeguards in place is more important than ever given the growing digital economy, and we will be speaking to government to present our view that reform of the UK law remains necessary. I’m grateful to them for this, and it is in itself very interesting. Privacy Laws and Business recently informed their news feed subscribers that the government is keen to hear from stakeholders their views on the future of the UK data protection regime, so maybe everything is up for grabs. But a fundamental point remains: if the EU (and indeed the CJEU – see Schrems et al) currently has exacting data protection standards for external states to meet to secure trading rights, realistically could the UK adopt a GDPR-lite regime? It strikes me as a huge risk if we did. But then again, voting for Brexit struck me as a huge (and pointless) risk, and look what happened there. Ultimately, I’m surprised and disappointed the ICO have resiled from their initial clear and sensible statement. I would have preferred that, rather than “noting the debates” about post-Brexit data protection, they actually directed and informed those debates.